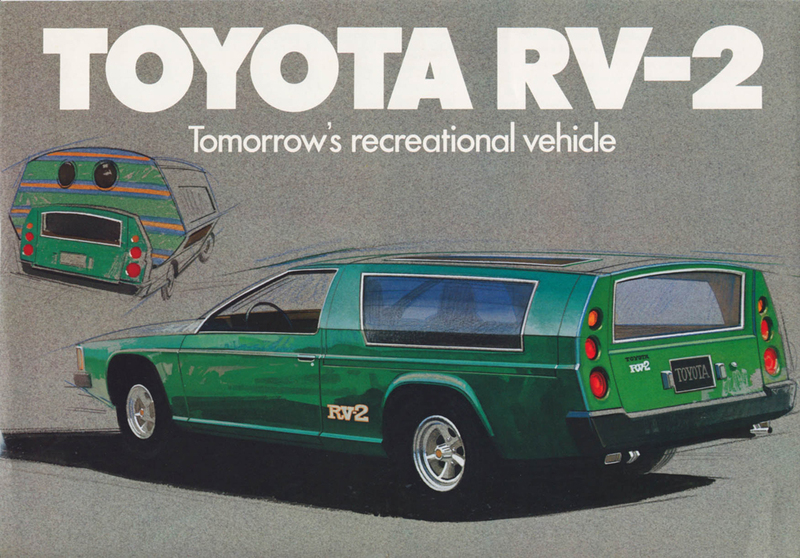 The RV-2 was a 2-door wagon concept car shown during the October 1972 Tokyo Motor Show and the April 1973 New York International Auto Show. Styling was up-to-date with sharply formed edges and large rectangular headlights. The front bumper covered only the corners, allowing the grill to be much more prominent than normal. The roof line terminated behind the large door on each side. Above the rear waistline were a pair of side hinged clam shell doors covering the entire rear section. An integrated roll bar terminated the body work and also formed a place for the clam shell doors to seal. The clam shell doors met each in the middle of the roof with no centre support. When the doors were raised you could stretch a tent between them. Two adults could sleep in the tent section and another two adults could sleep on the front seats, which could fold down flat. 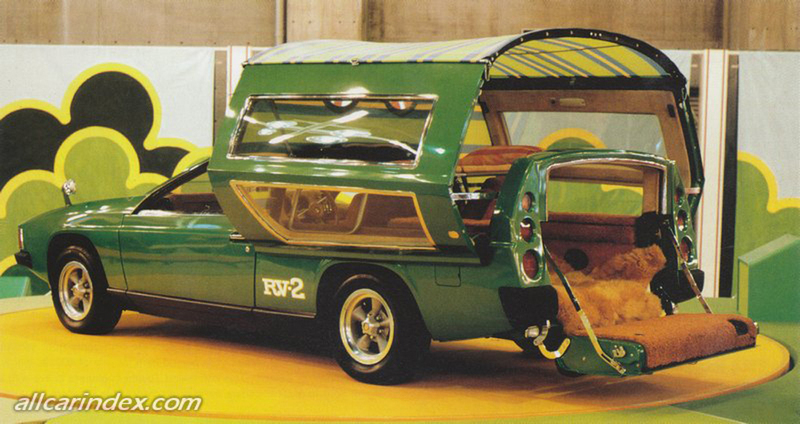 Finally, the rear section included a full width tail gate with a wind-down window nestled under the rear roll bar. Larger than the 1971 RV-1, some sources say the RV-2 was based on the Mark II while others say it was based on the Crown. Both the Mark II and the Crown shared major mechanical parts with the RV-2 (4M engine, transmission, suspension), so either could be true. The RV-2 uses wheels with 5 studs, just like the Crown and unlike the 4 stud Mark II wheels but these parts are easy to swap between the cars. The 2600 cc 4M engine was uprated to include SU carburettors to give 190 km/h. 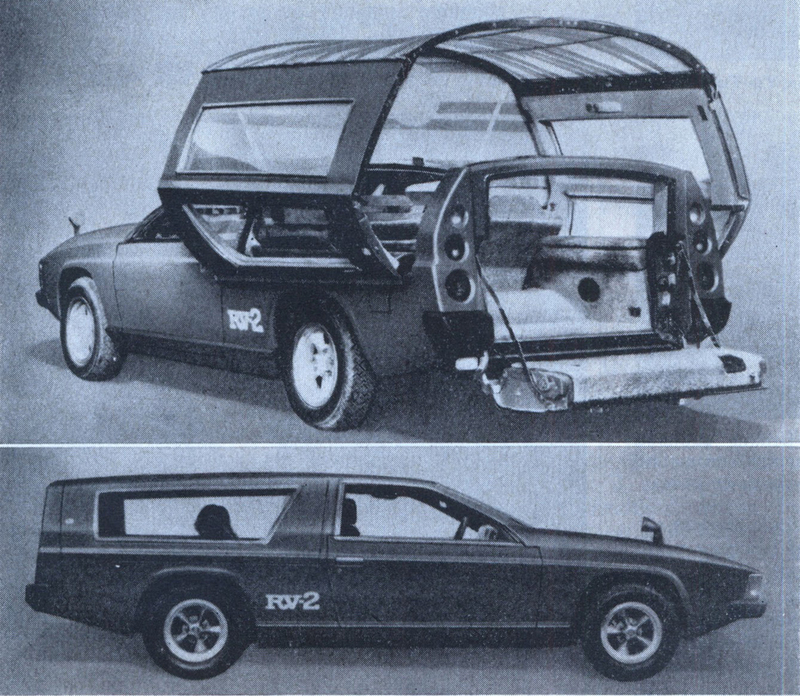 A fully working prototype in RHD was shown at the Tokyo Motor Show and reviewed in the August 1973 issue of Penthouse magazine. Toyota also printed a large number of a brochure for the USA market in order to gauge the market reaction. 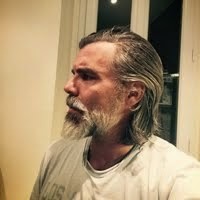 It was generally well received but apparently not enough to put it into production. The brochure included sketches with the steering wheel clearly shown on the left hand side but the photographs of the real vehicle hid the steering wheel - which was on the right hand side.